Mumbai, January 19th, 2016: GroupM, the leading global media management investment conglomerate, today released its biannual advertising expenditure futures report. 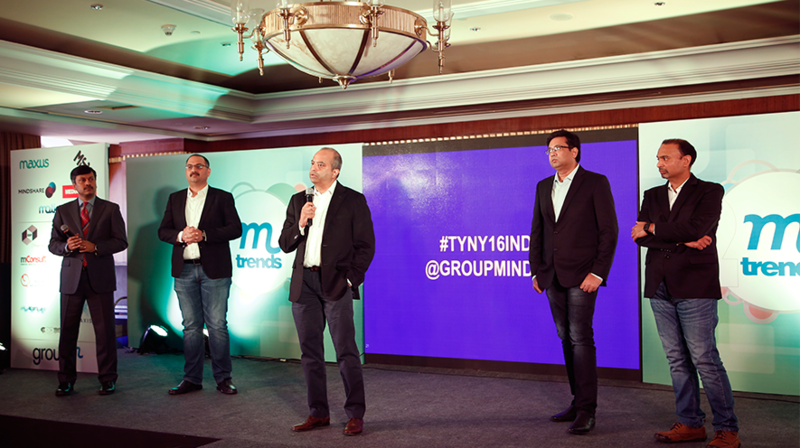 This Year Next Year (TYNY), forecasting India's advertising investment to reach an estimated Rs. 57,486 crores in 2016. This represents a growth of 15.5% for the calendar year 2016 over the corresponsdong period in 2015. The last calendar year closed on a promising notes, with the advertising expenditure in India closing at Rs. 49,758 crores, growth over 14.2% over 2014. Speaking at the event, CVL Srinivas, CEO, GroupM South Asia said, "India is the fastest growing ad market among all the major markets of the world. 2015 was the best year for ad spend we’ve had in the last five years. While global headwinds are building up in the new year, there are a number of positive factors that will help the Indian ad sector grow at higher levels in 2016. The GroupM TYNY report released today highlights these factors. While FMCG, Auto and Ecommerce which have been the top sectors contributing to ad growth in 2015 will continue to invest, Telecom, BFSI and the Government sector will see a ramp up. Events like the T20 World Cup, IPL and many state assembly elections will give a further impetus to ad spends. While Digital will remain the fastest growing platform, India is one of the few large markets where all traditional media platforms will show positive growth growth." FMCG remains the most dominant sector with a 28% share of the AdEx. Despite facing volume pressure, the sector is expected to continue ad investment aided by the softening of commodity prices. In 2016 Ecommerce ad spends are expected to be high on the back of increasing competition, market expansion and newer players entering the space. Many leading traditional retailers will be expanding their Ecommerce presence in 2016 even as consolidation continues in the sector. Another exciting development is the opening up of Ecommerce as a platform for advertising, which will see further traction in 2016. With the advent of 4G service in India, telecom service providers are expected to roll out extensive marketing campaigns across media. This roll out will also see global and domestic handset manufacturers launching new models of 4G/LTE handsets. Another big contributor to the Indian AdEx this year will be the Auto sector, on the back of multiple launches across both 4-wheelers and 2-wheelers. Lakshmi Narashimhan, Chief Growth Officer, GroupM South Asia said, "With significant number of users accessing internet primarily from a mobile device, ad-spend on mobile will become as large as the digital AdEx from two years ago. With digital media achieving audience reach numbers that are next only to Television, multiscreen planning is the order of the day. We have seen focused targeting of digital and native advertising with programmatic buying over the last 2 years, and this momentum will continue in 2016, as automation increases." GroupM estimates the Digital AdEx to grow by 47.5% in 2016 to Rs. 7,300 crores from the earlier Rs. 4,950 crores. A significant part of this growth is on the back of higher investments in cross-screen campaigns. The digital AdEx is estimates to take a 12.7% share of the total AdEx in 2016. 2016 will see Video on Demand (VOD) services gaining popularity in India. The Asia Pacific region is expected to overtake Western Europe as the second largest market for VOD services by 2020, fuelled by rapid growth of smart phones in China and India. With the recent Netflix service launch in India several domestic and international players will actively market their VOD services and acquire customers in the next 12 to 24 months. 2016 is estimates to be a better year for newspapers than 2015. The increase in ad spends expected from print heavy sectors like Auto, BFSI, and the Government sector augurs well for newspapers. Regional advertising of Telco and FMCG brands will benefit language dailies. While print as a medium is facing a lot of pressure from digital there is still headroom for growth in certain pockets and amongst certain audience clusters. While Radio is expected to grow a little over 10%, there is scope for the medium to pick up towards end 2016 when most of the new stations (set up after Phase III licenses, round 1 were issued) are fully operational. Digital audio platforms are gaining in popularity, opening up a new format for radio. There has been an upswing in Cinema Advertising in the last few years, which will continue in 2016 with an estimated 25% growth in ad spends. Recent acquisitions by larger multiplex chains will help create a far richer viewing experience for consumers, giving brands another avenue to capture their target audience. The medium can expect more brands to come on board with longer term deals if they invest in measurement and build more accountability. At present Cinema advertising is less than 1% of the total ad spend. GroupM is the leading global media investment management company serving as the parent to WPP media agencies including Mindshare, MEC, MediaCom, Maxus, and Motivator in India, as well as the programmatic digital media platform, Xaxis, each global operations in their own right with leading market positions. GroupM's primary purpose is to maximize performance of WPP's media agencies by operating as leader and collaborator in trading, content creation, sports, digital, finance, proprietary toll development and other business-critical capabilities. GroupM's focus is to deliver unrivalled marketplace advantage to its clients, stakeholders and people.